Make sure to keep the practice sessions and games fun. Avoid getting them to do drills, instead create fun games that teach them those exact skills. 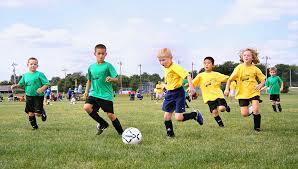 When it is no longer fun, the kids will not want to attend the practice and might drop out. Keep as many of the children engaged with the ball as possible. Long lines of standing and waiting for a chance to play or practice is invitation for misbehaviour. The more they are engaged, the more likely they will behave. Keep the lecturing to an absolute minimum. Young kids have short attention spans and you will lose them after a few seconds. Get your point across as quickly as possible. In most cases children of that age have about ten seconds of attention. Avoid keeping a leaderboard. Keep it fun by reducing the amount of competition between the kids. If the games become too competitive, it can reduce the fun and increase the chances of fights and other issues.